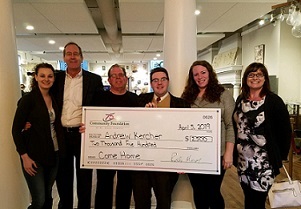 Andrew Kercher, our latest Come Home recipient, has a lifelong passion for sharing history, so when he got the chance to return to the museum that sparked his passion for the field he jumped at the chance. “My initial experience in the museum world came in the summer of 2009, shortly after the Great Recession started and try as I might I could not find work. Instead, I decided rather than sit at home (there was not even so much as Netflix back then!) I would go to the Port Huron Museum and volunteer my time,” he said. It was during his time as a volunteer that Kercher decided to attend Albion College and study history. He later attended Eastern Michigan University, where he earned his master’s in historic preservation. Shortly after graduating he took a job at the Dearborn Historical Museum. After a couple years there he decided something was missing - he wasn’t sharing his own local history. This February Kercher started as the community engagement manager at the Port Huron Museum. He was offered a $2,500 Come Home Award in January. Kercher isn’t the only young professional returning home. According to the U.S. Census Bureau, St. Clair County has the largest net migration of college-educated people in the state .